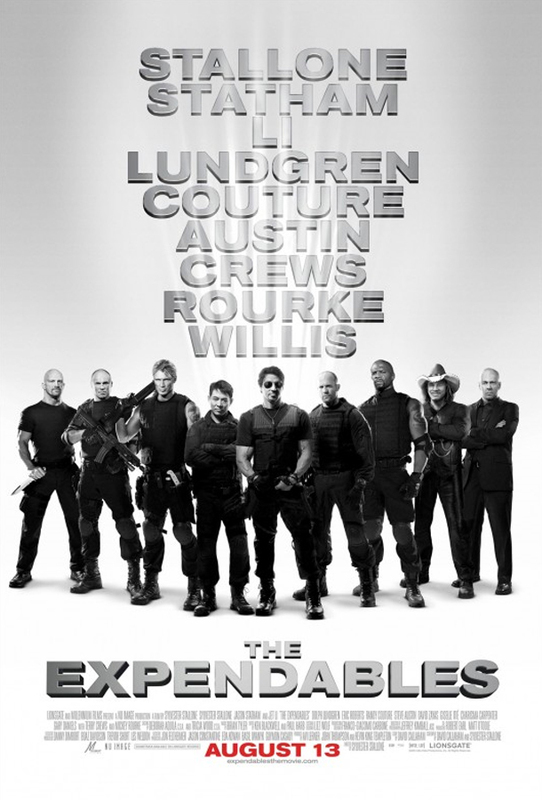 If you like your action with some well aged beef, The Expendables is for you. A lot of of people and sites have been dogging on The Expendables. This dogging unfortunately spoiled my opening day hopes and it took a few weeks for me to see it. I can sum up The Expendables like this…”The Expendables is awful….AWFULLY FUN, AWFULLY GORY, AWFULLY AMAZING!” This movie, much like Piranha 3D, is what you see is what you get. If you go in expecting a popcorn flick, you will not be disappointed. If you go in expecting Die-Hard, True Lies, Terminator, etc, you will be disappointed. There is almost no substance or story. The whole movie is there as a reason for all of the aging action heroes to strut their stuff one more time in a huge big budget action piece. It fulfills many of the qualities I need to make a movie like this entertaining. Does it take itself serious? Nope. Does it know this? Yup. Is the action big? Ayup! Are there quality kills? HELL YEAH! There is quality banter, some good one liners, and over the top kills that make you laugh and groan. The plot is very weak, however its not about plot, its about explosions, bullets, big knifes, and a repeating shotgun that shreds/explodes anything it is pointed at. The mercs, named he Expendables, are hired to take out a dictator in a South American island. Thus allowing the CIA to create their own regime change. There are a few snags, some shots are fired, stuff blows up and we move on. And I am not kidding there is the most powerful shotgun is the history of cinema in this movie. These shells are explained as shredding shells, they do more then shred. They adapt to what they need. Need to cut down a tree, use the shotgun. Need to make a elevated gun nest explode, use the shotgun. It is so over the top it is great. Much like some of the one on one fights that occur. There is a car chase that leads to a Lundgren v Li fight. There is a decent Stallone v Austin fight. All of which are fun, exciting and just crazy. The acting is tolerable. You know what you are in for when you realize Statham is the best actor in the lot. Again, we aren’t here for Oscar material, we are here to watch Lundgren fight Jet Li. Steve Austin fight Stallone. Oh and if I am giving anything away, you are really going to love this movie then! It is pure over the top action with little substance. A B-Movie with an A-movie budget. If you are someone that remembers and appreciates the action movies of the 80’s this one is right up your alley. There is not much here, because honestly there is not much to write about. If you like some good action, some old actors hamming it up and having a good time, then this is right up your alley. It is the summer action popcorn movie.